LALtoday takes a look at six congregations in greater Lakeland that have been around for more than a century and the evolution of the buildings where they’ve worshipped. A seventh is a new congregation that raises song in a historic building. The Lakelandist goes audio, looking into the origins of the Lakeland Christmas Parade in its first podcast. 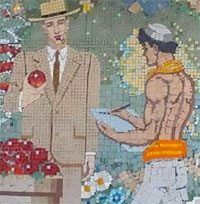 A tile mural created for a Publix store in Fort Lauderdale has been re-created by artist Tim Pitzen, right, and unveiled today at a former Publix store that now houses the Lakeland office of the Polk County Tax Collector. Standing alongside the artist is Gregory Fancelli, who spearheaded the project. Crews today demolished the false front on the building overlooking Lake Mirror that will become the Catapult 2.0 small business incubator. The facade, added more than a quarter century after the structure was built in 1924, will be replaced with a dramatic steel-and-glass entryway. 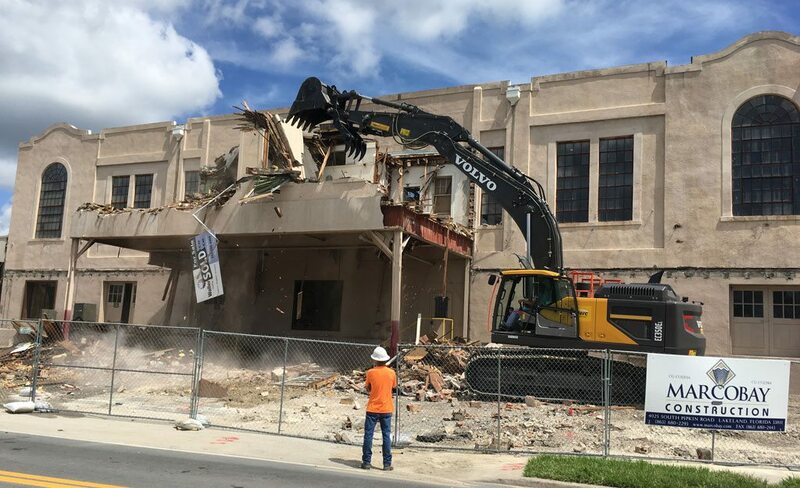 Next steps in the renovation project will be interior work to replace the concrete floors, according to Steve Scruggs, president of the Lakeland Economic Development Council, Catapult’s parent organization. Mosaic Removal Approved; Where Should They Go? Chamber: What If We Expand Our Current Building?